The HP Color LaserJet 3500 is a full-color laser printer that is affordable for small business and home office applications. This model is relatively easy to install and configure with most Windows operating systems and produces rich, vivid color and black and white output. This fast and sturdy printer, while lacking in expandability options and speed, is slightly superior in print quality than comparable models and is typically considered to be priced in the mid-to-high range of costs for personal needs. Both color and black and white printing are sharp and defined when default print settings are used. Image and graphic outputs are bold and life-like. Text document outputs are very sharp and professional-looking. A front-panel status LCD provides basic information as to the status of the printer during different points of operation, power states and idle states. Bundled software and drivers ensure ease of installation through a step-by-step wizard that interacts with the standard Windows USB plug and play capabilities. The Color LaserJet 3500 can be shared as a network resource through standard Windows printer sharing settings via a virtual printer port that is automatically configured. A resolution of 600 x 600 dots per inch for both black and white and color output is a respectable quality level for lower-end business and personal applications. HP Image Enhancement Technology utilizes algorithms that are designed to make printed images and graphics look their absolute best. 64 MB of installed RAM is more than sufficient to handle the rated printing speed for standard low-volume and infrequent printing. 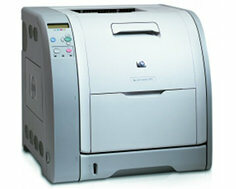 This model is built to handle increased printing demands, being rated at a duty cycle of 40,000 pages per month. 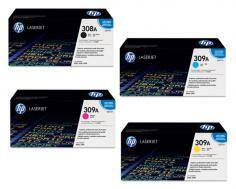 Printable media types include cards, plain paper, recycled paper, transparencies, envelopes, glossy paper and labels. A variety of media sizes are accommodated, ranging fro, 6.93" by 9.83" (B5) to 8.5" by 14" (legal). The total media capacity is 350 sheets, allowing for approximately 30 minutes of continuous printing at rated maximum output speeds. The maximum rated print speed for the Color LaserJet 3500 is 12 pages per minute for both black and white and color printing, considered to be on the low end for small office applications, although acceptable for personal home use. The price of the printer, although reasonable for a small office or business, is on the high end for personal use and can amount to double the cost of one of HP's basic DeskJet models, which once again makes this particular printer impractical for personal home use. The cost of consumables is almost as much as some of the higher end, all-in-one printers that are used to produce higher volume and better quality work. The total page yield for toner cartridges is respectable, although it would take approximately a year to run them out of toner when only occasional and low-volume printing is done. There are no networking capabilities for Ethernet or TCP/IP protocols, limiting connectivity to printer sharing through the computer that is directly connected. There is limited expandability in this model, severely limiting the upgrade options that are available. With a footprint of 19" (W) by 17.6" (L) by 18.4" (H) and a weight of 71.6 pounds, this printer demands solid desk or table space and will take up a lot of room on a work surface. The default color settings are too bold and rich for some people, who find it necessary to make manual incremental adjustments to make the document output easier on the eyes and require less toner. This can be a time consuming process that can cause toner and paper waste. Printer firmware and drivers can cause unpredictable printing results when printing from certain graphic editing applications. As of the date of this writing, the Color LaserJet 3500 is not certified as compatible with the Windows 7 operating system. Review it: "HP Color LaserJet 3500 "
Shipped with this printer are one black toner cartridge with a maximum yield of 6,000 pages, as well as cyan, magenta and yellow cartridges with a yield of 4,000 pages each. 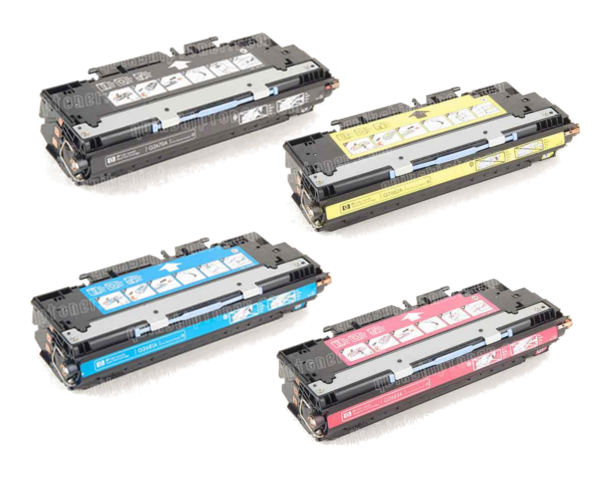 Given the higher-than-average price of replacement cartridges for this particular printer, the value of the toner that is shipped with the unit is worth approximately half of the sale price, which is a decent initial investment.